New website, same great product! 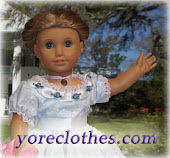 'Doll Clothes of Yore' is proud to announce the publishing of our new website. It's easier to navigate and use, and our pictures are now more clear. We want to know what you think!